ClickShare is a fully digital solution that also works with analog devices. Visit barco.starin.biz for more details. Our editors recently asked Yoav Nir, business development manager for Barco, to share the inspiration and strategy behind the company’s new ClickShare product. It is a unique tool; in some ways, it is its own product category. Read why this product came through R&D, and how it applies to AV integrators and end-users alike. Q. What was the inspiration behind Barco’s ClickShare? Did AV dealers ask you for it? End-users? Please tell us a little about the impetus and development. A. Indeed, we often hear the comment that it seems ClickShare came from left field. Yet, there is a logic to how we came up with ClickShare. As you know, Barco has been providing the enterprise with visualization solutions for many years. These solutions are very high-end, fulfilling a niche need. For example, 20-foot by eight-foot rear projection walls that are used in the oil, gas, and automotive industry to facilitate their decision-making. Where to drill for oil or what design of car to go for are crucial decisions where every mistake is costing tens of millions. An improved decision can generate a much higher return. In order to facilitate the decision-making, we provided the user the capability to share multiple laptops or workstations on the screen simultaneously and to share it over a networked connection. Our users appreciated these capabilities and asked us to provide a solution that both in terms of price and performance can fulfill their need for improved collaboration and decision-making outside the high-end segment we were catering. So, for example, all PiP layouts and scaling are done automatically by ClickShare for the user. During the development process, we listened to many partners from within our ecosystem: end-users, resellers, distributors, and consultants. This helped us in fine-tuning ClickShare to the level of simplicity it has today. Q. How reliable is this system? Does it come with a warranty? A. We have followed the classical PLC process, that is start with socalled alpha units, then beta units and last zero units prior to going for full production. Extensive testing was involved, both inside and outside of Barco. Our hardware has proven to be very reliable. The unit comes with a one-year standard return to depot, time and material warranty. There is an opportunity to extend the warranty for three years. A specific SLA can be worked out with the resellers representing ClickShare. Q. How are user devices like laptops powered? A. The ClickShare Button has no battery. We made that decision based on the feedback from our ecosystem as mentioned above. No batteries means much easier and cheaper to maintain. Thus, the ClickShare Button gets the power from the laptop’s USB port. To give you an idea, the ClickShare Button consumes less power than a regular external webcam. Q. What resolution(s) is/are supported? A. We support displays up to a resolution of WUXGA, that is 1920 x 1200 pixels. As for the laptop resolution, the average laptop resolution of three megapixels can be handled by the system. The theoretical limitation on the input resolution is higher, but is traded off by a decrease in performance. Q. Is there a significant network impact? A. This is an important point. ClickShare shares the content over a proprietary wireless network between the ClickShare Button and the Base Unit. This is transparent to the corporate network. 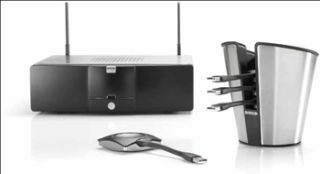 ClickShare can work in the 2.4Ghz as well as the five GHz band and the channel can be set per system. I mentioned that we make communication possible via the ClickShare Button. Indeed, there is a wireless chip in our ClickShare Button to enable communication. The advantage of that design is that the PC’s Wi-Fi capability is not affected by ClickShare. Hence the user can remain connected while using ClickShare. This is a key difference from most wireless solutions out there. Q. Can multiple units co-exist in the same building without interference? A. Yes. First of all, the range of our wireless signal is typically limited to 100ft. Second, the units can be set to different frequency bands and channels. Last but not least, there is a unique pairing between each ClickShare button and its base unit. Even if the units are within each other’s range and on the same channel, there is no confusion for the buttons which base unit they should connect with. We work both on the 2.4 Ghz band and the 5 Ghz band and support the available channels in line with the local regulation. Q. Does it use Wi-Fi? A. We make use of the industry standard IEEE 802.11 a/b/g/n. Q. In higher ed or corporate environments, can this system work with SMART Boards, Prometheans, or other interactive whiteboards? A. It has no specific integration capabilities for interactive whiteboards. Q. Can in-house AV technicians install the system, or is a highly specialized installer required for ClickShare? A. ClickShare is quite straightforward to set up. When using DVI, HDMI or Display Port, the automatic EDID exchange between base unit and display should work well. If using VGA, it might require a manual set up. Obviously the more technology is used in combination with ClickShare, for example video conferencing equipment, the more knowledgeable the installer needs to be. Q. Say a user wants to spec ClickShare into his or her 2013 budget plan, but needs to justify the ROI first. How would you address this topic? What should we keep in mind? A. That is an excellent question. There are hard and soft ROI elements one can take into consideration. I would like to start with the soft ROI. Without a doubt the key benefit is improving the productivity of meetings and enabling better decision-making. The reluctance to use the cable is replaced by the eagerness to click the button. Team members can now show and share data interactively and simultaneously. Now that everyone is hearing each other and is seeing the same content, participants understand each other faster and better. This is a fundamental catalyst for productivity and decision-making. Integrating ClickShare can certainly have immediate savings compared to the standard cable solution. For example, many buildings do not have a false floor. Hence cable cubbies need to be cut through the floor. This by itself can cost more than the ClickShare solution. Q. What else do technology managers in commercial AV need to know about this system? A. For one, it is very flexible. The ClickShare basic set comes with a base unit, a tray, and four buttons. One can add/pair up to 25 buttons to one base unit. This gives the AV manager a lot of flexibility in the number of ClickShare buttons per room. Also, the AV manager can move the buttons from room to room. ClickShare is a fully digital solution that also works with analog laptops. As ClickShare works via the USB port, we share the desktop image digitally, independent of the graphics card of the laptop. This makes the room compatible with all laptops, both those with VGA outputs and the new generation, which only has a digital output as for example HDMI.